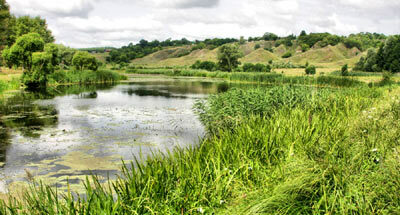 Zapovednik Tsentralno-Chernozemny is situated in Kurskaya and Belgorodskaya Regions. The Zapovednik was founded in 1935. Its area is 6,3 thousand ha, consisting of 6 separate parts: Streletsky, Kazatsky, Barkalovka and Bukreevy Barmy — in Kurskaya Region; Yamskoy, Lysye Gory and "Stenky Izgorya" — in Belgorodskaya Region. 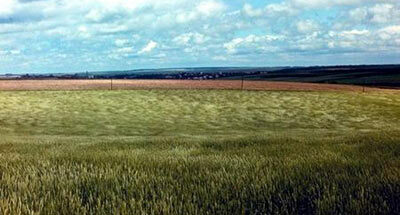 It is situated on the Mid-Russian highland in the forest-steppe zone. The relief is erosion, with the land deeply cut with gullies and ravines. In the soil cover typical fertile black earth, that has never been tilled, is present. 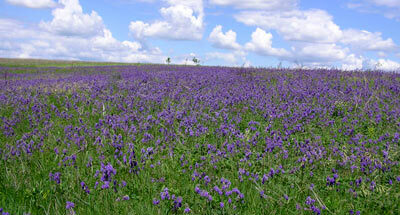 In the plant cover areas of meadow steppe combine with oak forests. Virgin meadow steppes are distinguished by their unique floristic richness, great number of species and of specimens, thick and variegated herbage (up to 80 higher plants’ species on 1 square m), picturesqueness. The most common plant species are: Bromopsis inermis, Festuca valesiaca, Poa angustifolia, Stipa pennata, and Helictotichon desertorum. Oakeries are mostly of coppice origin, with a Park-like character, and are surrounded with thick outgrowths of bush made up of sloe, Cerasus fruticosa, brier, and Russian almond. Natural restoration of broad-leaved forests formed by small-leaved lime, Norway and common maple, European ash, mountain elm with undergrowth of bird cherry and hazel, takes place. There are lowland reed-sedge bogs, and areas with a peculiar flora on lime-stone slopes. Flora accounts for more than 900 vascular plant species including 36 rare ones (Bulbe-codium versicolor, Fritillaria ruthenica, Androsace koso-poljanscii, Daphne cneorum, Orchis militairis, Orchis ustulata, Paeonia tenuifolia, Schivereckia podolica, Stipa dasyphylla, Stipa pennata, Stipa pulcherrima, Cotoneaster alaunicus — all of them are in the Red Data Book of the Russian Federation. Fauna combines species typical of both forest and steppe. Insects are the most numerous with more than 4000 species including 24 that are specially protected (one of them — common stag beetle). Vipera ursini and sand lizard are numerous. Of birds (with in total 184 species) species from the European fauna subset are wide spread. Of rare birds long-legged buzzard nest; and white-tailed eagle, golden eagle, peregrine falcon, fish hawk, steppe eagle, saker falcon, Levant sparrow hawk are to be seen in the Park. Rodents are numerous; badger, fox, elk, wild boar, roe are usual; and wolves also live in the Zapovednik. The Zapovednik has biosphere Zapovednik status.